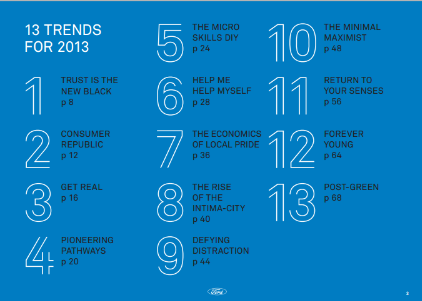 Last month, Ford released its first-ever trend report, “Looking Further with Ford: 13 Trends for 2013.” Aside from a story in USA Today, it was mostly picked up in auto trade publications. That’s a shame because it contains some intriguing insights into consumer buying habits as well as interesting social, technological, economic and environmental trends. To be sure, Ford does a good job of inserting itself into the equation. It pats itself on the back in several places for its innovative, fuel-efficient cars. But I highly recommend a download of the report. It has an infographic look, with lots of icons, charts, mini-case studies and cool typography. In it’s intro, Ford writes that “after a half-decade of disheartenment…consumers are ready to trust again.” But this time, Ford says, our trust is not in institutions, but in ourselves and in “the things that we believe to be real and truthful.” Okay, I’m all for that. Trust as a differentiator: Given its relative scarcity, trust is emerging as a key positive differentiator for brands. Correlation of trust to brand equity has increased by 35 percent since 2009. As a result, brands are having to rethink how they communicate with and reveal themselves to consumers—the more real and authentic they are, the better. Personal accountability is on the rise, and with it, a comfort with failure: 80 percent of adults globally disagree that “there is little I can do to change my life” and 82 percent say that having and admitting failures is critical to overall success. As a result, they are taking risks, blazing their own paths and reshaping conventions. 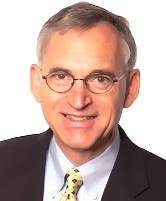 Ford identifies 13 trends that support these three themes. Trend #5 is called “The Micro Skills DIY.” I personally like this one because I have always been a do-it-yourselfer (DIY). I just didn’t know it was trendy. From remodeling the homes I’ve lived in to building my own company website, I’ve always preferred to do it myself. Of course, DIY requires developing skills that you may not have had before. Ford describes how technology has facilitated this, reducing the learning curve and making new skills more accessible. As a result, we are starting to shift away from the notion of linear expertise—rather than just refining one set of skills, we are looking to expand them and leverage them. In one survey that Ford cites, 65 percent of the respondents said that “since the recession, I realize I am happier with a simpler, more down-to-earth lifestyle.” Hence, the rise in green living and the sharing and resale of used items. Below are all 13 trends. Download the report, and see which ones you identify with! This entry was posted in Marketing and tagged 2013, collective empowerment, DIY, Ford, green living, micro skills, minimalism, trends, trust. Bookmark the permalink. Thanks for sharing this! I’m very intrigued by this report — and part of me thinks that some of the trends align with the reasons why I started my own blog. Cheers!